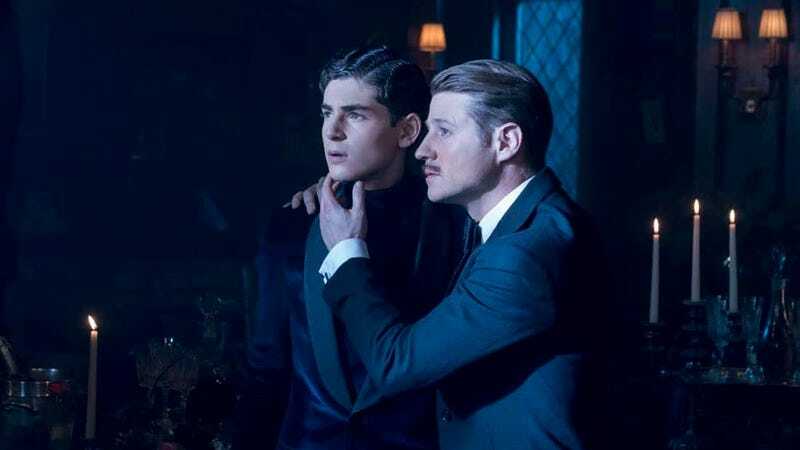 Bruce (David Mazouz) must look away from Gordon’s (Ben McKenzie) beautiful yet imaginary mustache. The problem with a show as relentlessly bonkers as Gotham is that it’s hard to make one episode’s craziness stand out from another. But last night’s episode, “A Beautiful Darkness,” shocked me on more than one occasion, mainly because Bruce Wayne met a DC character I never, ever expected he’d meet. It was Batman, of course. Yes, this show is about young Bruce Wayne (David Mazouz), and no, time travel was not involved. Instead, Bruce—who, after failing to prevent Ra’s al Ghul from slitting the throat of a young child earlier in the season, has tried to drown his desire to fight crime with booze and casual hook-ups and general rich teen hedonism—gets scratched by Poison Ivy, who has now aged up from a teen into a full adult thanks to some mysterious Chinese potions, which also gave her the ability to murder anyone she scratches by making plants grow inside them. Ivy’s scratches also provide hallucinations while the victim is dying, apparently, a side effect which exists solely so Bruce can go on a mental journey that starts with Ra’s al Ghul cutting his face off, and turns into a party at Wayne Manor where Gordon has a mustache, Lee is dressed as Cleopatra for some reason, and Bullock is holding a rooster. Bruce meets Batman. Look, I know it’s kind of hilarious when you put the whisper-thin Mazouz next to a CG shadow in the bodybuilder shape of the comic book Batman, and I know this Batman doesn’t have a bat-ears on his cowl, but let’s not kid ourselves as to his identity. After all, when the figure leaps at Bruce he explodes in a swarm of bats, marking what I’m pretty confident is the first time Bruce Wayne has ever seen a bat on this goddamn show. But there’s something really, really cool here, too. Bruce had only dabbled in mask-based vigilantism for a while before the Ra’s al Ghul incident sent him down the path of billionaire playteen. Of course his true desire is to fight crime, and the idea that Batman is the “real” Bruce Wayne while Bruce is the performance is nothing new. But Gotham posits that somewhere in his subconscious he already is Batman—not just a guy who obsessed with fighting crime as a vigilante, but a guy who wants to fight crime by being a vigilante who wears a cape and uses preternaturally deep voice, in order to become an urban legend that inspires fear among all of Gotham’s criminals. The idea that Bruce had this theatricality inside him, long before he had any kind of plan, is sort of fascinating. If nothing else, Gotham is always at it’s most satisfying when Bruce takes firm steps to becoming Batman, and getting hit with a swarm of bats—even in a weird plant-death hallucination—is a major, major advancement. PS—Also in this episode: The Joker made the Penguin out on a clown costume and then the Joker went to kill Penguin but Penguin mimed he was in a box and Joker couldn’t get to him.